Well, it�s been a while. I have been busy and haven�t had time to write. And it has been windy, so I haven�t been doing much photography either, but I have done a little. I don�t find a lot to photograph in the winter. Not that there aren�t opportunities if you know where to look. But I am a big fan of colorful photographs, and this time of year, that can be hard to achieve for a nature photographer. It�s amazing though, some of the insects that are out this time of year. There are clouds of mosquitoes or gnats or whatever they are. I saw some just a few days ago. And a few weeks ago when I took a walk in one of the pastures, there were still little grasshopper nymphs scattering before my feet at almost every step. I have tried several times to get some good shots of them, but so far I haven�t been satisfied with the results. A few weeks back I also noticed a sulfur butterfly being tossed about in the wind. In addition, over the last few days I have been seeing a Bald Eagle flying over. They are neat to watch, but it would take quite some effort for me to get any shots worth speaking of with my equipment. I don�t have any lenses that are long enough. There are also lots of Canada Geese that like our pond. Maybe if I push myself I can capture some good shots of them. If it wasn�t for the wind, I would be out with my camera now, and I�m sure that I could find something interesting to photograph. I guess maybe I will be able to expand my portfolio with some snow shots sometime this winter. I would love to be able to take decent photographs of snow crystals, but the only microscope we have is not the best of quality, and unfortunately has too much magnification. I have succeeded in taking a few acceptable shots of snow crystals in past years, but only very, very small ones. They are so interesting though. The variety is one thing that amazes me. I guess God has expressed to us His endless creativity in that no two snowflakes are ever alike. I guess I could find some color in winter in sunrises and sunsets. But on second thought, it would be some cold weather to shoot in! Also, it is hard to find a spot on the property that is a good place to shoot just the sunset. Plain old sunsets can get boring. Usually it is good to have something else besides just the sunset as the focus of the shot, like a silhouette. Maybe I will check out a few good spots to shoot silhouettes as soon as I get some good camera gloves so I don�t get frostbit! Anyway, over the last couple weeks I have found some moss to shoot, and also got some more neat shots of our John Deere model A. I could have gotten some better shots of the old tractor if the ground had not been wet, for then I could have simply lain on the ground. But the ground was muddy and wet, so I couldn�t. For some reason, I love to take photos from the ground level. I think it is the change of perspective that I like. If you think that�s weird, then you are probably right. But maybe you should still try it sometime. You are probably weird too. This moss really caught my eye when I was out one day last week. But I didn�t have my tripod with me (I have to get a strap for it), so not all of the shots I got turned out. So I went back with my tripod a few days later to shoot some more. The textures are kind of neat. I think they are anyway. There are lots of different kinds of moss growing down here on the farm, and I look forward to shooting more. I just wish that I could get even closer! I don�t know if you can have too much zoom. Not that you should always use all that you have all the time, but I think that you could never put more zoom at my disposal than I could find a use for! Anyway, I will write more when I find some more things to photograph! I know I said in my last post that I should get out more often, and I have. Yesterday was warm, so I got a chance to go out and have a little fun with my camera. I went out in the afternoon, and took a lot of shots of the Canada Geese on our pond. As I expected, I don't think any of them are really anything spectacular, but I was mainly just having fun. I enjoy getting out and walking around the farm. The real news is that I went out yesterday morning to get a shot of the sunrise. That's not so hard this time of year, because you don't have to go out sooo early, but it can be cold. Fortunately it wasn't too cold, and I was able to get almost all of the shots I wanted. 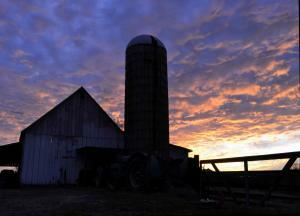 I have been trying to get this shot of the cow barn and silo silhouetted against the sunrise for about a month, and haven't really gotten any shots I liked. I think that I have tried about three times, and have only really got one nice shot, which I haven't uploaded yet. But this time I had my new full-size tripod, instead of my smaller one, and I was able to get some nice shots. At first I wasn't sure whether any of them had really turned out that great, but now the more I look at them, the more I like them! Anyway, I just wanted to do a post on them. It is warm again today, so I will probably go out again, but I really find little to photograph this time of year. I am a big fan of every color that God put in the rainbow, and this time of year the color is harder to find. But don't worry, I will keep looking. 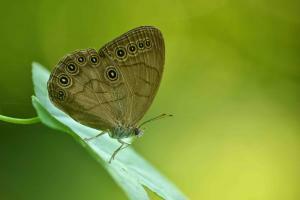 Today I will be taking you back to the little swampy area where I got the shot of the Appalachian Brown butterfly. Back up the swamp a little way, where it diminishes to little more than a muddy stream bed, there is a wooded incline, which is beautifully decked with ferns. At the bottom of this incline, a few feet from the edge of the mud, stands a large tree, at the base of which, I found my subject. As with the butterfly, I was not aware that this species of flora was present on the property. Actually, I haven't been able to identify exactly which species it is yet. 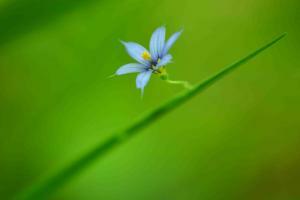 But there were several Blue-eyed Grass (Sisyrinchium sp.) plants growing there. It is tough to identify them, because the same field guide that tells me that there are 37 native species, only describes three or four. These plants are not grasses, they are really something like Irises. And, again despite their names, yes, I know, their �eyes� are not blue, but yellow with the whole flower being blue. These plants are small, and were less than a foot high. The low light from being in the woods required a tripod. Fortunately, I had my small tripod with me, and was able to get this shot. It was a little dark, so I had to lighten it up a bit. This is just the type of habitat these plants grow in. They grow in moist places. I guess it was the perfect niche for them. I will certainly be looking for them again this year. They are such beautiful little creations which God has made. They bloom in the spring and early summer, and this one was photographed on May 21st, at 1:41PM, which happens to be just before the end of the world. (The first end of the world, not the second one). Anyway, I�m looking forward to getting out there again this spring. I don�t find much that I really enjoy photographing in the cold, cold, cold, winter. I know some people have much colder winters than these here in Maryland. That doesn�t make me want to go out in the cold, though. I know, I should force myself to get out there. I will. Maybe in the snow or ice, maybe for a frost, or a sunrise. But today it is windy. I hate wind. Of the top ten biggest problems wildflower photographers face, wind is the first 26. I don�t know if you knew that or not, but now you do. Anyway, I will sign off now. Hey, maybe the wind will die down this afternoon. Maybe. We just had a small snow flurry, while the sun was out, no less! An interesting experience. Don�t we always say that about photographic equipment? It does everything I need it too, and is sure to be sturdy, so who needs carbon fiber? I will see what I think after a season of using it. But can five pounds really be so much? I know, after carrying it for three hours, that�s 15 pound-hours, but it�s good exercise, right? It�s the first full-size tripod that I have ever owned, so I can�t wait to use it. It�s pretty tough to photograph wildflowers without one. I�ve already made up a bloom planner for all of the wildflowers that I have found growing on our property. There are about 200 or so thus far, and probably a few more I haven't noticed yet. I may not be able to photograph all of them satisfactorily in just one year, but I am going to try. During the spring and summer, there may be as many as 35 that I will need to photograph in the same month, which comes out to more than one per day. Of course I don�t really plan to be going into the field every single day, and if it�s windy, or in some cases sunny, that will also make things difficult. I guess I will be planning to get up early to catch the morning light, but that is a limited time too. I don�t know if it�s realistic or not to expect to photograph all of them in one year, but I guess it�s worth a try. I just had to tell about my new tripod, so I�ll take you back to the little swamp next time (see my last post). Probably next week. Over and out. Today I am going to blog about my photo Appalachian Brown. I took this shot earlier this year. July fifth at 4:55 in the afternoon, to be exact. I had taken a walk down to the woods. I say down to the woods because the house is on the top of a hill. To get to the wooded area at the edge of the property, you have to walk down the hill through a cow pasture. At the edge of the woods is a manmade pond, into and out of which flows a small stream. There is a crossing beside the pond, directly at the edge of the woods. Behind the pond, is another even smaller stream, which backs up into the pond, creating a shallow pool and a small marshy area. Further up this becomes little more then a muddy bed a few feet wide. But right behind the pond at the edge of this small marshy area, grows, among other plants, several sedges. I did not know it at the time, but this is the perfect micro habitat for Appalachian Brown (Satyrodes appalachia) butterflies . Their larvae feed on sedges, and the adults frequent wooded areas with standing or slow moving water. But as I said, I did not know this until later, when I had identified the butterfly from my photos, and learned more about it from a field guide. So I was pleasantly surprised to find this one, in pristine condition, resting on the leaf of a Sweet Gum sapling which was growing by the edge of the marsh. The light was low, so I had to use my tripod. It took a little while, but for the most part the butterfly was cooperative, and I came away with one decent shot. Because the light was low though, I had trouble gauging the exposure, and it turned out a little underexposed, so I had to lighten it up a bit. Some people might pass this species off as just a little brown butterfly, but as you can see, they are beautifully patterned with eyespots and stripes. Next year I will be looking for more. I find it amazing how fast this micro-habitat was colonized by the butterfly. It has only been in existence less than 10 years, and I am sure that the sedges probably didn�t grow for the first several seasons. A few days after this I returned to the same vicinity, a small clearing on the other side of the swampy area. As I was walking at the edge of the clearing, I noticed something fluttering. And there was an Appalachian Brown butterfly perched on some weeds. It was probably the same individual, but it was somewhat badly worn. The edges of its wings were in tatters. Butterfly wings are very delicate and wear quickly. They cannot be regenerated either. That is probably one reason why most adult butterflies do not live very long, only a few weeks. Some may only live a few days, but I think some species in the tropics can survive for up to a year. But even if butterflies did have the ability to heal their wings, their diet, which is usually made up of nectar which is poor in protein, would not provide enough energy for them to anyway. So it got me thinking, what about in the garden of Eden? I don�t believe that anything died until after the fall (when Adam and Eve sinned). So how did butterfly wings have the potential to last forever? First, there wouldn�t be any predators, which probably do much of the damage. But it still seems obvious that butterflies would need the ability to regenerate their wings. I have not studied the particulars of butterfly wing anatomy, but I think that it is probable that they once had the ability to regenerate their wings. God created earth with a perfect climate and environments, so it is probable that plants were able to take in much more energy than they do today, because there was much more available. This increase in energy would in turn have been passed on to pollinators, and would enable butterflies to have enough energy to regenerate their wings. Also, because their wings would not become damaged as quickly, because there wouldn�t be any predators, they would have more time to gather and store that energy. I theorize that butterflies later lost this ability, possibly through mutation, after the fall, or perhaps after the flood when the climate was dramatically altered. It is reasonable that this should happen, because any mutant would probably have a greater chance of survival/reproduction because all of its energies would be put into reproduction, while those individuals that did not have the mutation would probably not have the energy to reproduce, so the variety with un-regeneratable wings would perpetuate the mutation, while those having the ability to heal their wings would die out. Those which could heal their wings would also have less chance of survival because they would probably not have enough energy to escape from predators. Anyway, it is an interesting thought, and when I see this photograph it often reminds me of how great it would be to live without the curse of sin. In my next post I will probably talk about one part of the flora in the little swamp, but until then, happy holidays! I have been wanting a blog so that I could blog about my photos. But for my first post I figured that I should talk a little about my approach to nature photography. Different people approach this in different ways, but I have a philosophy of nature photography that probably differs some from the average. As a Christian, I approach it from the perspective of creation being God's handiwork. When He created each creature He filled them with beauty. Today we are surrounded by this natural beauty, and my approach is to try to capture this beauty in my photographs. The way I see it, I am just portraying to the best of my ability the work of the Master Artist. I am simply an apprentice attempting to portray His works in a manner that captures as much of the beauty which He has placed there as possible. Now, the side affect of this is that because I am simply capturing the beauty of the Master Artist's work to the best of my ability with the tools He has given me, I don't get all the credit for the beauty in my photographs,God does. But on the other hand, I do take the blame for anything less-than-perfect. Speaking of tools, (besides the natural artistic talent which God has given me) I use a Nikon D3100 camera. Nothing special about that or my two main lenses, and 18-55 mm and a 55-200 mm. I do lots of close-up photography with these two non-macro lenses. That brings us to one of the most important pieces of equipment which I use. If you didn't know, you might think it was just an ordinary filter. But its actually a Nikon 5T close-up diopter. If you don't know what that is (and I didn't a few years ago) it is an achromatic close-up diopter. That is, it is two elements of high-quality glass, which magnify, and which also shorten my maximum focusing distance to about 2'. The second of the two elements is a chromatic aberration correction element so that your photos are not distorted, meaning that they will be of much higher quality. I know from experience that this is a big advantage over holding a magnifying glass in front of your lens. Of course, that was with my old point-and-shoot. But it taught me a valuable lesson; the concept of a close-up diopter. The fact that the 5T screws on the front of your lens instead of you having to hold is also a powerful feature. If you want to take nice close-ups without cluttered backgrounds, with your current non-macro lenses, than I can testify that this is a great option. (Note that unfortunately Nikon does not make these any more, but you can buy them used like I did, or I think Canon and other manufacturers may make two-element close-up diopters too. Remember, make sure it is two-element or else your pictures will be of much lower quality). I really like the way I can use this diopter to de-clutter the background and bring the focus to the beauty of the particular subject. I also use a tripod of course, when it is short enough. The one that I have been using isn't full-sized, but I just bought one so that I would be ready in the spring. The one that I have been using goes down to about 8", but if you are a close-up nature photographer you probably realize that that will certainly not be adequately low in many situations. When the tripod won't go low enough, I just place the camera on the ground (on top of something, especially if I require a little height). That works great for me, but I have found that the best and most comfortable way to make a shot in that situation is to put myself flat on the ground too. That works well for me too, because I am skinny and when I lay flat on the ground, I am flat on the ground, and I actually enjoy it. Of course if you lay on the ground you may get dirty, wet, muddy, bitten by spiders, or attacked by ants. Just don't say I didn't warn you. Generally I don't edit my photographs, except to occasionally fine tune the exposure. Again, my point is not to create a beautiful shot through manipulation, but to capture the beauty which God placed in creation. So, I try my best to take photographs that do not require correction of this sort. I am very much a 'perfectionist' and am extremely critical of art in general, and especially my own work. Being as critical as I am has its benefits, one of which is that if one uses it properly it can help one to greatly improve one's skill. But at times, one can also depress one's self with all of one's imperfect shots. Anyway, I try to use it constructively, and have learned to consider it a gift.